The Low Emission Zone (LEZ) was introduced in 2008, covering most of Greater London and operating 24 hours a day. It was introduced to encourage heavy polluting vehicles driving in the capital to become cleaner. However, from 8th April 2019 this will be changing and any petrol or diesel vehicle driven within the Congestion Charge area will need to meet the new tighter emissions standards of the Ultra-Low Emission Zone (ULEZ). These will be stricter emission standards than the London-wide LEZ standards that are already in operation. Your vehicle may not meet the ULEZ emissions standards even if it currently meets the LEZ standards. Electric vehicles are exempt from this charge as they produce zero emissions. So, if you are thinking of making the switch to electric then now is the perfect time to purchase an award-winning Nissan LEAF or e-NV200. What is the London LCV Scrappage Scheme? 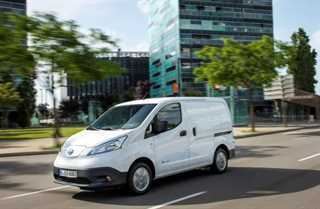 The Mayor of London has launched a Van Scrappage Scheme with a reward of up to £3,500 for Euro 6 Vans & £6,000 on Electric Vans. From the 8th April 2019, the 24 hour, seven days a week, Ultra Low Emission Zone (ULEZ) will be introduced in central London. Vehicles not meeting the ULEZ emissions standards will need to pay a daily charge to drive within the zone. The Mayor of London has launched a Scrappage Scheme to support microbusinesses and charities in buying vehicles that will comply with the emission standards of the ULEZ zone. £3500 towards a Euro 6 Diesel Van for scrapping a pre-Euro 6 Diesel Van. £6000 towards an Electric Van for scrapping a pre-Euro 6 Diesel Van and help with running costs. This is in addition to the already existing Plug-In Van Grant. Micro businesses with up to 10 employees; or charities. Business must be registered in Greater London; or the vehicle to be scrapped must have been driven in the Congestion Charge Zone for at least 52 times in the last 6 months. Maximum of 3 vehicles per business owner, applicable to every pre-Euro 6 Light Van and Minibus. Vehicle must be scrapped at an approved Authorised Treatment Facility (ATF) and a Certificate of Destruction (CoD) must be provided. Fully electric vehicles are now storming the market with the Nissan LEAF leading the way. Not only do you save on fuel costs - you also don’t pay any road tax. You will also be helping the environment as these vehicles produce zero emissions. Owners of EV’s are also eligible for government incentives such as the ‘Plug-in Grant’ whilst also being exempt from congestion charges. If you are looking to make the switch then you can view our LEAF or e-NV200 offers or speak to a member of staff at one of our 15 dealerships. For more information on the ULEZ click here.